Rolling out of your cozy bed and coming into a fluorescently lit office every morning leaves much to be desired. But the employees at women-run beauty, health, and lifestyle company Camille Styles can't relate — sorry. That's because the "office" where they work is a residential home that's been designed to the nines. Camille Styles, who runs the company, is the author of a book on entertaining — so she knows a thing or two about aesthetics. 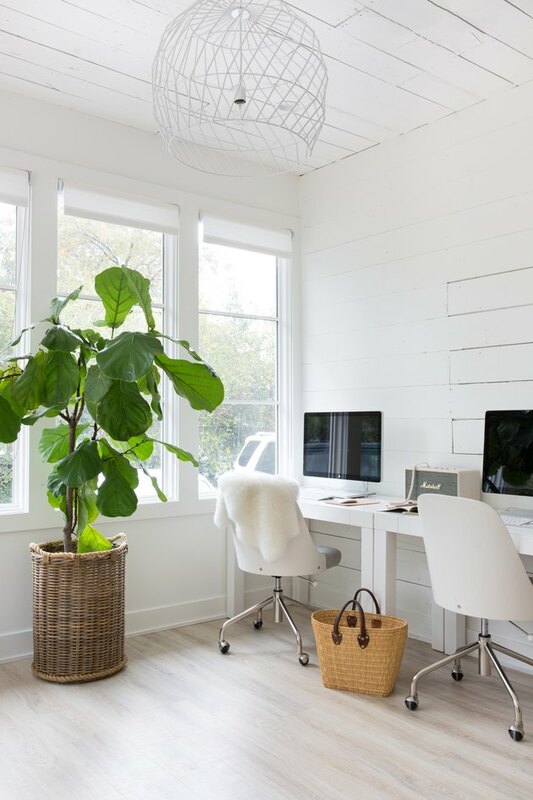 For years she searched for the perfect work space, before coming across this century-old bungalow with a ton of potential in Austin, Texas. 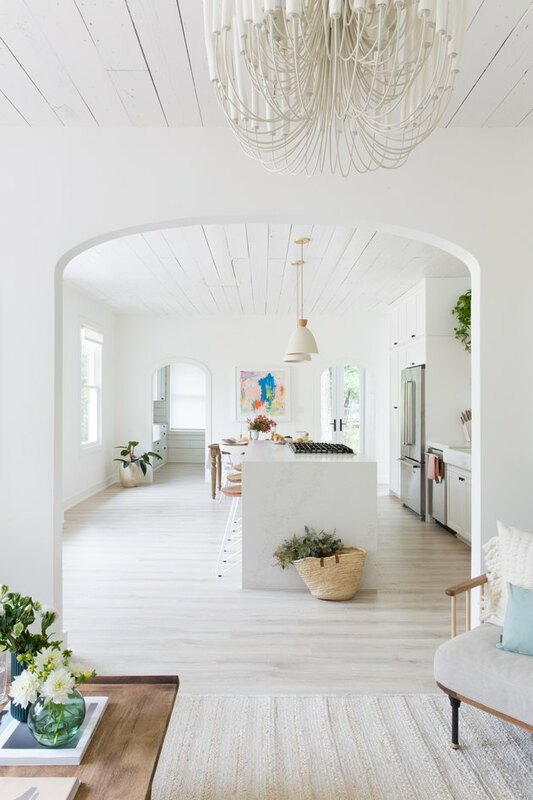 Austin-based architectural firm Low Design Office (LOWDO) was hired to give the home a complete makeover while preserving its historic charm. The team at LOWDO removed and relocated just a few walls to create an open, light-filled space. Before the renovation, the 1,100-square-foot house, located downtown, was in terrible shape, with paint peeling off the walls, facilities that no longer worked, and aging yellow floors. After, the white-on-white space is cheerful and airy. 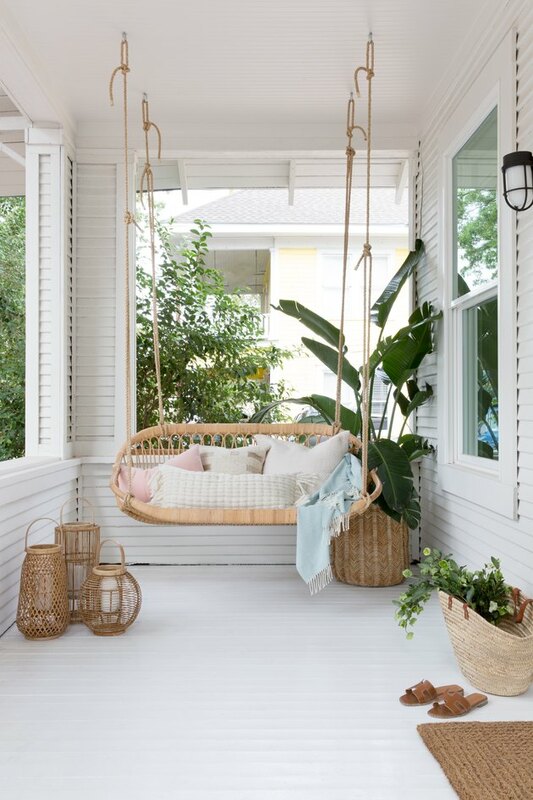 On the porch, a hanging rattan bench from Serena & Lily is covered in pillows, like the Simple Linen Lumbar Pillow from Hawkins New York. It's the perfect place to rest during a lunch break. A large plant sits nearby in a Serena & Lily Tall Bamboo Petaluma Basket. Laminate floors never looked so good. These are the Pergo Max Premiere floors in San Marco Oak topped by a Burnished Wood Coffee Table from Anthropologie. The Ludlow Sofa from Maiden Home is covered in comfy pillows like a Simple Linen Lumbar from Hawkins New York and a Serena & Lily Winter Beach pillow. The texture of the Tiered Tapers Chandelier from Anthropologie in the living room is emphasized by the home's monochromatic background. 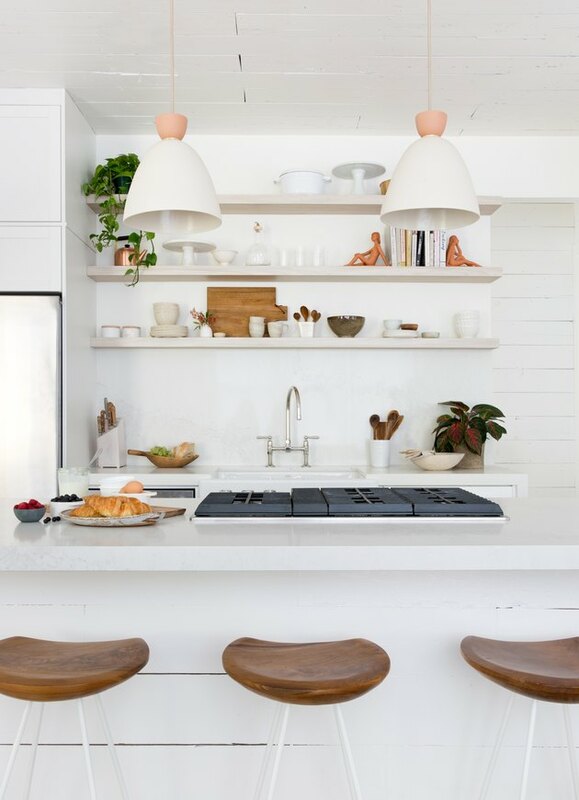 The white-on-white look was picked to brighten up the home. Plus, it totally works with your Instagram's white theme (in case that's what you're into). 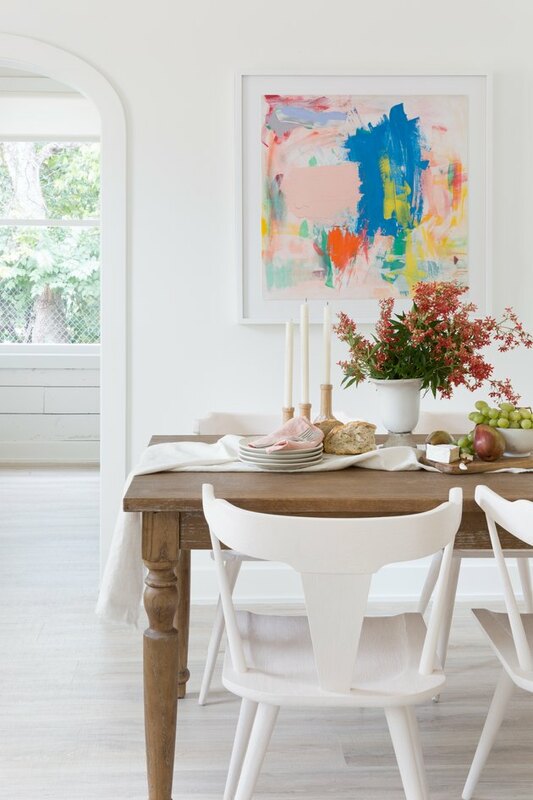 Dark-wood tables stand out among the light oak floors and white walls, as seen in the dining room. Framed minimalist art by Guy Dill for TWYLA can be found throughout the house-turned-studio. 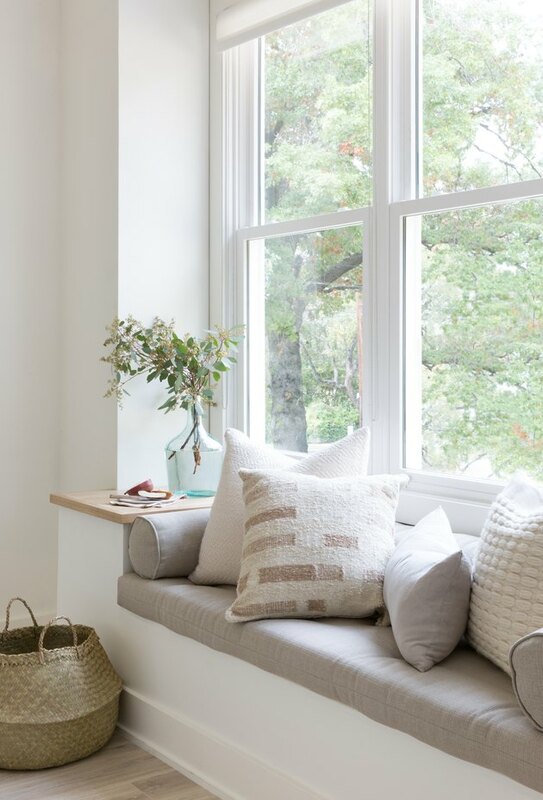 Original to the home, the kitchen window nook is given a new purpose with custom-built seating. Custom cushions are paired with Serena & Lily pillows. 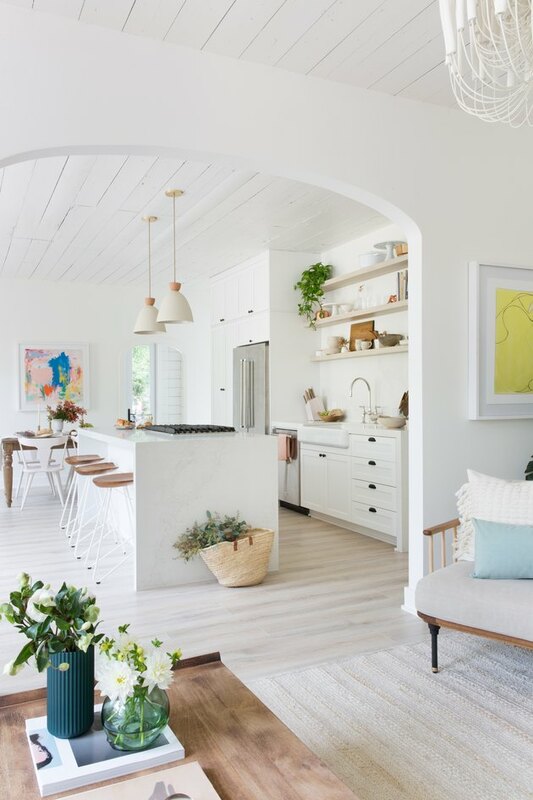 The kitchen island is capped in Calacatta Nuvo 5131 from Caesarstone and customizable Smooth Bell Pendant lights from Rejuvenation hang from the 100-year-old ceiling, which is covered in original shiplap. Custom cabinets and shelves were designed and built by local Lavish Kitchen + Bath. The kitchen is also outfitted with a KitchenAid stainless steel fridge with French doors and a new sink with Kohler's HiRise Faucet. A contemporary Parson's Desk from West Elm is paired with a modern desk chair, also from West Elm in the home's office space. Styles' team can cozy up in the Monaco Throw Blanket from Serena & Lily. The new design showcases the 100-year-old bungalow's original charm effortlessly, we'd say.